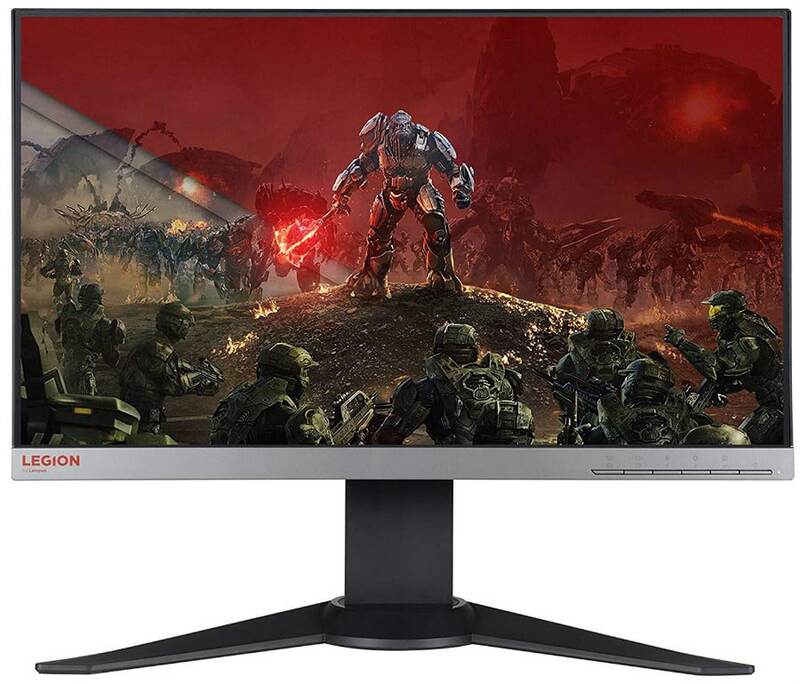 The Lenovo Y25F-10 presents excellent value considering it’s a gaming monitor with all the right gaming features that comes from a premium brand. This model is competing with various esteemed rivals, but we can say it’s one of the better-looking options out there. The Lenovo Y25F-10 isn’t as common as our favorite gaming monitors around the globe, so let’s check out if it’s worth chasing after. The Lenovo Y25F-10 adopts a business attire-aesthetic which includes a matte silver color instead of the usual matte black. However, its betrayed by the Legion brand emblazoned in red on the bottom strip along with a few extra features in the frame. The front is bezel-free on three sides like most 25-inch gaming monitors, but in reality, it’s a dual stage design which still has a thin inner border. Build quality is as good as some of the brand’s best-known products such as laptops which are considered very durable and reliable. The Lenovo Y25F-10 didn’t get cut corners during manufacturing and design, as proven by the tight seams and the even plastic panels. The display doesn’t wobble with something as simple as a bump on your desk thanks to the well-executed physical design. One thing we dislike on the Lenovo Y25F-10 is its use of OSD buttons instead of a joystick for OSD manipulation. The layout is located at the front on the bottom corner so it’s easy to access, but its less convenient and is considered archaic by today’s standards. You also get a few valuable extras with the Lenovo Y25F-10 which is designed subtly but is still purely a product for gaming enthusiasts. There is a pop-out headset hanger on one side of the display and a connectivity hub with USB slots and a headset jack for convenience. Frankly, we love these usually overlooked add-ons on gaming monitors since they are useful for the intended users. The device is supported by an oversized stand with a boomerang-shaped base which looks overkill for the size of the display. You can tilt, swivel, pivot, and adjust the height of the Lenovo Y25F-10, so it’s easy to attain a perfect view angle. You can also opt for VESA mounting with 100 x 100 adapters once you remove this mechanism to reveal the bolt holes. 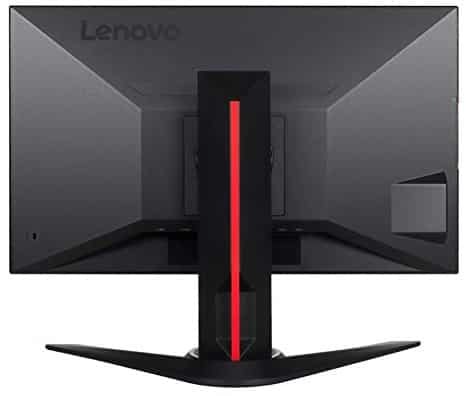 The Lenovo Y25F-10 is a FreeSync monitor, so it doesn’t come with connector restrictions like G-Sync variants. The layout at the rear includes DisplayPort 1.2 and HDMI 1.4 for primaries along with two other USB slots which you can use for accessories such as wireless chargers for your phone. There are no speakers on the package, but that’s forgivable since most will use headsets anyway. The Lenovo Y25F-10 sports a 25-inch TN panel with a 1920 x 1080 resolution, 144Hz refresh rate, and 1ms response time. A typical contrast ratio of 1000:1 is also listed, along with a 400 cd/m2 backlight which is brighter than the usual found on other 1080p variants. The brand advertises this model to be HDR-compatible, but it doesn’t have the necessary features so it will only translate HDR10 signals as best as it can. 1080p at 144Hz is still the universal standard for competitive gaming, and it fits best in a 24-inch form factor. This formula also means that the product will also be reasonably priced while still being able to offer an upgraded gaming experience. The Lenovo Y25F-10 is also easy to maximize with a mid-tier GPU since it doesn’t require a lot of juice to display games at its maximum refresh rate. The Lenovo Y25F-10 posts excellent image quality out of the box once it’s scrutinized with a colorimeter. The TN panel covers 98.5% of the sRGB gamut which is slightly lower, but it does so with an accuracy score of Delta E 2.3. Color temperature is slightly higher than the ideal 6500K, but the extra coolness of the white balance is something we know most would prefer over the warmth of a perfectly tuned sRGB color output. Gamma is right on the dot at 2.2, so there is little to tweak on the Lenovo Y25F-10 other than its brightness setting. You do have to get on that right away before using the monitor since it maxes out at 430 cd/m2 which is simply too bright for extended use. The only weakness we could see is the monitor’s 890:1 contrast which is lower than other TN panels we’ve tested. The latter affected black luminance a bit, but the screen doesn’t look too grayish for all types of users compared to IPS panels. Only a VA panel is better in this regard due to its higher contrast limit, but then again, that also dictates the extra vibrancy of the screen. The Lenovo Y25F-10 doesn’t suffer from panel uniformity issues since it’s evenly lit with no backlight bleeding present. Color uniformity doesn’t have deviances which go beyond DE 2.8 from the ideal D65 standard, although black uniformity could use a bit of improvement. Of course, this aspect varies from panel to panel due to the nature or limitations in manufacturing. The Lenovo Y25F-10’s motion handling isn’t as good as we expected since its average response time is much slower than other TN monitors we’ve tested. The screen displays minimal blurring which you can notice if you look close enough during fast-paced sequences, dispelling the 1ms spec listed by manufacturers. Fortunately, the monitor carries an overdrive setting which you can set to its median level to remove the flaws completely. The Lenovo Y25F-10 is a FreeSync monitor which makes it perfect for AMD GPU, but it isn’t certified to work with Nvidia GPUs and G-Sync. Input lag is slightly higher at 10ms compared to its closest competitors, but the difference is too little to notice. The Lenovo Y25F-10 is fantastic at one thing such as color quality or design, and yet it needs improvements in another such as its contrast or its higher input lag. We love how the brand packaged and priced this monitor, which certainly makes it easy to overlook some of the flaws. The monitor performs quite well for its intended use, but there are better-performing options for around the same price. Consider the Lenovo Y25F-10 if you want something neatly packaged which looks refreshing compared to the sea of black and red gaming monitors we already have. The monitor isn’t the best out there, but it’s worth a second look.